Escatawba Farms has become a premium destination for us, and for good reason. 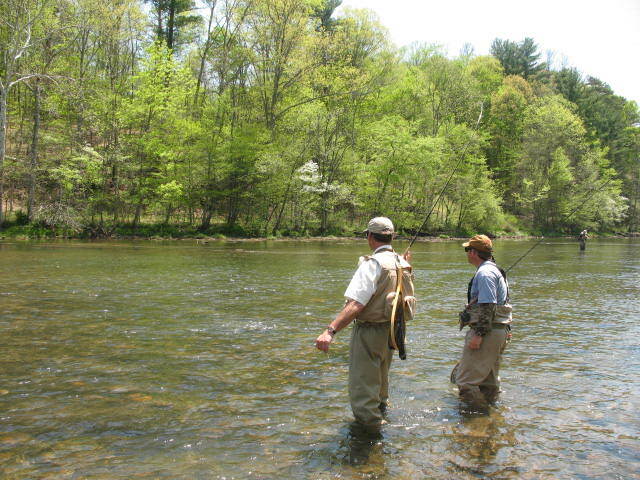 The Farm is an equisitely manicured, well-maintained fly fishing haven with an abundance of heavy rainbow, brook, and brown trout. Located in Alleghany County, Virginia, Escatawba is situated on Dunlap Creek, a spring-fed stream that runs between wooded mountainsides and fenced pastures. Its the perfect balance of superb angling and picturesque scenery that keeps calling you back, time after time. For novice anglers and seasoned experts alike, Escatawba boasts a beautiful one and a half acre spring fed lake; in addition to the nearly two and a half mile stretch of water you’d swear was Montana. And, with three ponds teeming with huge trout where you can try out your technique or watch them laugh at you from the comforts of the underbrush, there’s something for everyone, at every skill level. With only 8 rods permitted on the property per day, you’ll have no trouble spending a little extra time matching that perfect fly. Most outings are spent catching fish and seeing no one. We will take up to 6 anglers per trip. While on each trip we will usually “highlight” a particular method or technique, it could be said we’ll use many methods during the day to catch fish. The point is to catch fish but also to give our guests something to learn that they can take back to their home waters and catch fish. 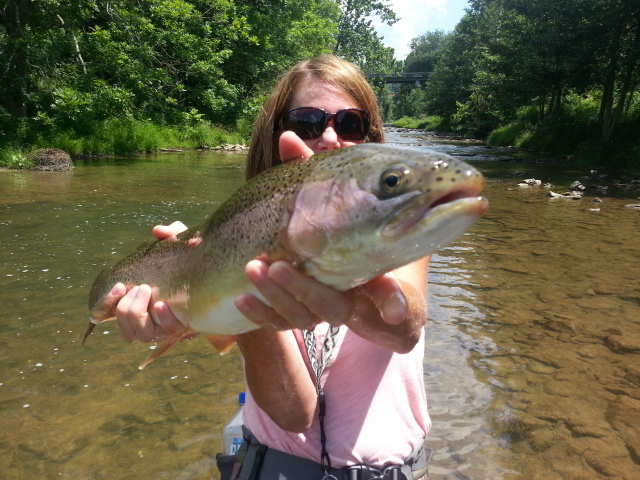 Trip Rate is $295.00 per angler , and includes stream access fee for private water, guided fishing, flies. Lunch, Transportation. Lodging, license, and gratuity not included. 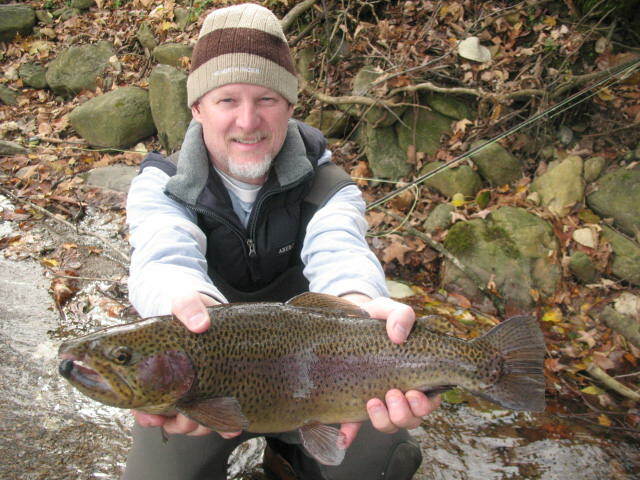 Client Mike James with a 28″ Escatawba rainbow……. 3 waters available and these waters have some of the largest fish you will catch East of the Mississippi, and many fish will rival anything out West. A fish up to or over 10lbs is a real possibility on any of these trips, and 20 inch fish are pretty much normal…..a given. Two rivers, Little River and Big Cedar Fork, are both fertile limestone tributaries to the Clinch River and contain some real leviathans. Not only some of the largest trout you’ve ever held in your hands, but also some trophy smallmouth opportunities during summer and fall months. A third water, Wolf Creek, flows along with the Clear Fork and is a trib to the New River just north of Big Walker Mtn. Wolf Creek has large fish as well as more than a few smallmouth that can be trophy size as well. Due to limited access, the desire to promote these trips to our customers, and the premium experience, these trips are $295.00 . This can be done on any date and the way you do it is just message me with the date you’d like and we can go from there. Season is September through early June. You can visit our contact us page here and message right from there about the trip and the date you’d like….very simple! 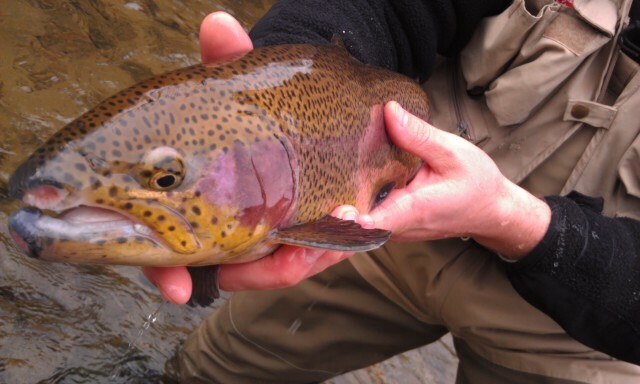 Get your shot at some real trophies ….let’s Go Fly Fishing! Wild in Wyoming…….we’re hosting a week trip to one of fly fishing’s most storied settings, Jackson Hole, Wyoming, right in the shadow of the Grand Tetons. We’ll be fishing the Snake River drainage and the Wind River Drainage. A part of the trip is into the remote Wind River Wilderness where we will be fishing East Fork, Wiggins Fork, Bear Creek, Burroughs Creek ,Horse Creek , Whiskey Basin, Warm Springs, Black Rock Meadows, Wind River Lake, Buffalo Fork, Spread Creek, Jacks Fork, Cliff Creek, N and South Cottonwoods, Granite Creek, Hoback , etc. Great food, great company, great scenery, and outstanding fishing. 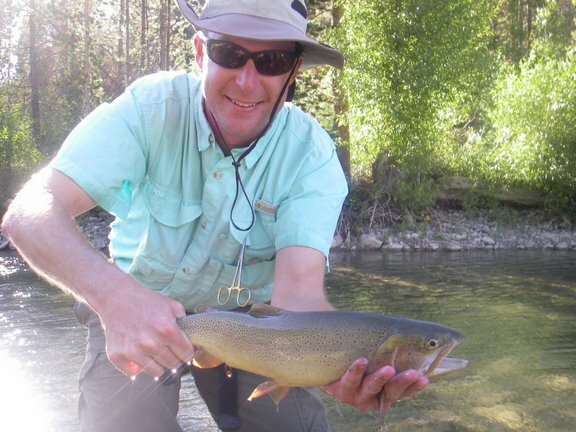 We will likely catch several species of trout- – -cutthroats, Snake River finespot Cutthroats, Colorado River cutthroats, browns, rainbows, brookies, and even some cuttbows too. Photo Left: Gregg Williamson of Oak Ridge, NC with a monster cutt from a section of the Hoback River you could hop across. Includes 6 days fishing, 7 nights lodging, all meals, Flies for fishing, all ground transportation. Not included is airfare, fishing license, gratuities. 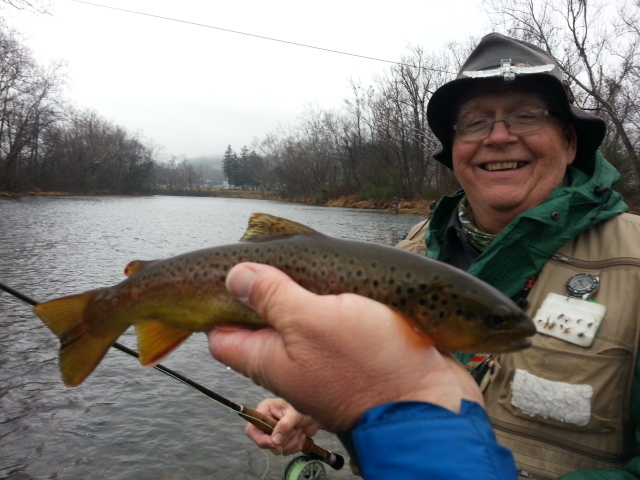 Anglers bring their own gear, rods, reels, waders, flies, etc. Year in and year out this one is a client favorite. Trip Rate for 2019 is $2495.00….Same as its been for a decade! We have a high percentage of repeat business for this trip…. come on the trip and find out why. I will gladly meet with you by appointment and go over every detail of the trip if you are interested in this trip. I have a ton of materials, photos, videos, etc, to help you learn more about this great trip. Don’t miss your opportunity to join us for this great trip! In the interest of preserving the quality of the trip we are limiting our trip to 3 anglers….Dont miss out! Message me here if you’d like info or to book a space on this trip. Click here for a link to 2018 trip photos. Our 2019 Wyoming trips are SOLD OUT. We have already begun booking for August 2020. If you are interested please contact me via our contact page here and I’d be happy to provide more info or answer any questions you may have. 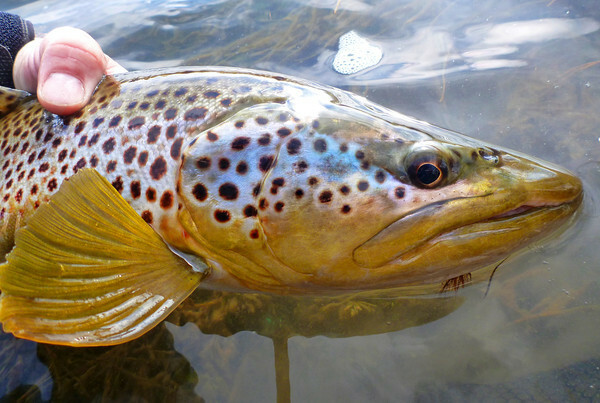 6 Day Trip, we’ll be fishing the world famous White and Norfork tailwaters, browns, rainbows, brookies, and cutthroats….but the chances at trophy browns are what make these waters world famous. We’ll be getting in 4 days of fishing, which includes 3 days floating and one day of wade fishing. 4 days fishing, all meals, lodging, all ground transportation included. We can take up to 4 anglers per trip, now taking reservations for our Sept 2019 trip….should be another great one! This one will likely sell quickly…. Trip Rate is $1795.00 per angler. Contact us here if you are interested in joining us on this great trip, or if you’d like more information I’ll gladly provide info on it. In addition to the trips we design and host, we also are a licensed Frontiers International Booking Agent and can help you choose/book any one of many trips both domestic and international – – -from fishing in the NE United States to the Western Rockies to New Zealand to Australia to the Bahamas- – -fresh or saltwater we can help you arrange/plan the trip of a lifetime. Call me at 336 944-3628 or shoot me an email if I can help or answer any questions you may have. American West destinations include Idaho, Montana, Colorado, New Mexico, and Oregon. International destinations include Argentina, Africa, Alaska, Canada, Chile, Iceland, Mexico, Mongolia, New Zealand, Russia, South America, Bahamas, Venezuela, and more. To learn more check out the Frontiers Travel site here .